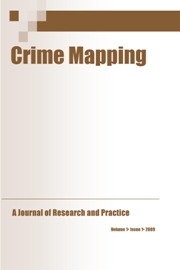 Issues of Crime Mapping: A Journal of Research and Practice may be purchased online for $36.99 and include single-user secured electronic access to all articles contained within the purchased issue. Single-articles contained within any issue of the journal may also be purchased online for $18.99 and include single-user secured electronic access to individual articles that are purchased. Note: Orders are processed through PayPal's secure payment server, which may not function properly with some Mac® or older-version Windows® browsers. Please report any problems you may experience while submitting an order.